Existing Users: Upgrade for only $99.50! Maintenance Contract : $49.50 What is this? Pay once and receive Xfrog Maya 5.x 2018+2017+2016! 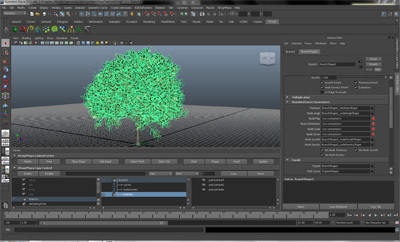 Xfrog is an extremely powerful plugin inside Maya, and the set of tools that come with were perfect for animating a growing tree, sprouting branches, realistic bark, and a huge variety of lush leaves. I always go to Xfrog when I need any 3D plants. The Xfrog Maya procedural organic 3D modeling plugin enables you to create and animate 3d trees, shrubs, flowers, nature based efx and biomemtic architectural forms. Xfrog enables even the most casual user with the powerful ability to create and animate organic models. Take the Feature Tour to see what Xfrog Maya can do for you. Some common examples of Xfrog Maya include: tree growth, tree seasons, blossoming flowers, complex nature-based effects, abstract, and many other uses. Xfrog instances individual components using multiplication objects such as Branch, Phyllotaxis, Hydra, and Variation. New in Xfrog Maya, the resulting child instances are individually editable. When using Phyllotaxis to create a flower, the petals are child instances resulting in a very good petal multiplication arrangements using Natural Rules (based around a sphere using golden mean). Xfrog 5 for Maya now offers the ability to edit each individual petal. The same goes for Branches: as always, Xfrog 5 makes extremely natural looking tree branching, but now each branch spline can be edited individually, located in x,y,z coordinates. or affect any single part of any single branch. Individually editable instances are highly desirable for advanced modeling and are the main new feature set of Xfrog Maya. For detailed usage of all new features, see the Xfrog 5 Reference Manual 2 . Xfrog for Maya adds many new procedural Objects to MAYA. By combining these with Maya components/objects you can create a wide variety of organic models and animations based on the building blocks of Nature. Branch Object - Create multi-level branching structures with extremely realistic growth. Animate from seed to adult tree. Phyllotaxis Object - Arrange components using the mathematical "golden section". e.g. a sunflower's petals and seed patterns..
Hydra Object - Arranges components in user defined specialized circular patterns with a wide variety of uses. Curvature Object- Creates Splines which can be used as a basis for naturally curved leafs or twigs: A very powerful addition to Maya. Variation Object - Combine different Objects with the Branch, Phyllotaxis and Hydra Objects, for example you can use different leaves scattered throughout a tree, or any sort of variations that you need for higher realism. Tropism Object- Robust Photo and Gravitropism Simulator which pulls the entire hierarchy towards gravity and towards light, with infinite user controls over animation and strength. All Xfrog Objects can be animated by varying their parameters: Growth, number of branches, strength of attraction, gravitropism, or phototropism, and each parameter of every Xfrog Object can be animated! With this flexibility, Xfrog Maya can animate things like blossoming flowers or trees growing from seed to adult. With Xfrog Maya, you are adding a formidable procedural organic modeling capabilities to Maya. Xfrog Maya includes 11 XfrogPlants species, free! Get started with high quality 3d models featuring species of trees from around the world. Each fully textured plant includes variations in age and shape. If you currently have a license for Xfrog 5.5 for Maya 2017, you are eligible for a free upgrade to Xfrog 5.6 for Maya 2017. Simply download Xfrog 5, install and request a permanent key. Users with earlier versions of Xfrog can upgrade here . Download a fully functional 30 day Xfrog Maya! here. Xfrog Software and XfrogPlants are used by major production houses including WETA, Disney Imagineering, Digital Domain, Pixar, Sony Imageworks, ILM, Dreamworks SKG, Electronic Arts, and Sony Entertainment. Many customers purchase XfrogPlants to compliment their Xfrog software. XfrogPlants are realistic, highly detailed, fully textured 3D plant models created with Xfrog software. We have nearly 3000 models, with 600 species represented, downloadable as libraries or as individual plants in Maya, max, c4d, lwo, modo, microstation, Vue, obj, bryce, 3ds, and xfr(xfrog) formats.